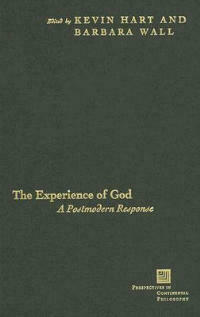 The book provides a series of approaches to the ancient question of whether and how God is a matter of "experience," or, alternately, to what extent the notion of experience can be true to itself if it does not include God. On the one hand, it seems impossible to experience God: the deity does not offer Himself to sense experience. On the other hand, there have been mystics who have claimed to have encountered God. The essays in this collection seek to explore the topic again, drawing insights from phenomenology, theology, literature, and feminism. Throughout, this stimulating collection maintains a strong connection with concrete rather than abstract approaches to God. The contributors: Michael F. Andrews, Jeffrey Bloechl, John D. Caputo, Kristine Culp, Kevin Hart, Kevin L. Hughes, Jean-Yves Lacoste, Crystal Lucky, Renee McKenzie, Kim Paffenroth, Michael Purcell, Michael J. Scanlon, O.S.A., James K. A. Smith. Kevin Hart is Notre Dame Professor of English and Concurrent Professor of Philosophy at the University of Notre Dame; among his many books are The Trespass of the Sign: Deconstruction, Theology, and Philosophy (Fordham), and The Dark Gaze: Maurice Blanchot and the Sacred. His most recent collection of poems is Flame Tree: Selected Poems. Barbara Wall is Special Assistant to the President for Mission Effectiveness and Associate Professor of Philosophy at Villanova University. She is co-editor of The Journal of Catholic Social Thought and The Journal of Peace and Justice Studies.